(Nanowerk News) A team led by scientists at the U.S. Department of Energy's Lawrence Berkeley National Laboratory (Berkeley Lab) found a way to make a liquid-like state behave more like a solid, and then to reverse the process. They put a droplet of a liquid containing iron oxide nanocrystals into an oily liquid containing tiny polymer strands. They found that a chemical additive in the droplet can compete with the polymer – like a tiny tug of war – on nanoparticles at the intersection of the liquids. They were able to cause the nanoparticles assembled here to jam, making it act like a solid, and then to unjam and return to a liquid-like state by the competitive push-pull action of the polymer and the additive. “The ability to move between these jammed and unjammed states has implications for developing all-liquid electronics, and for interacting with cells and controlling cellular functions,” said Tom Russell of Berkeley Lab’s Materials Sciences Division, who co-led the study with Brett Helms, a staff scientist at Berkeley Lab's Molecular Foundry. The Molecular Foundry is a DOE Office of Science User Facility that specializes in nanoscience research. "We were able to watch these droplets undergo these phase transformations in real time," Helms said. "Seeing is believing. We are looking at the mechanical properties of a 2D liquid and a 2D solid." The results were published in Science Advances ("Guiding kinetic trajectories between jammed and unjammed states in 2D colloidal nanocrystal-polymer assemblies with zwitterionic ligands"). They watched this movement between the two states simply by looking at changes in the shape of the droplet. The changes provide information about the tension on the surface of the droplet, like observing the surface of an inflating or deflating balloon. They used an atomic force microscope, which works like a tiny record player needle to move over the surface of the droplet to measure its mechanical properties. The latest study builds on earlier research (Advanced Materials, "Reconfigurable Printed Liquids") by Russell and Helms, visiting researchers, and others in Berkeley Lab’s Materials Sciences Division and at the Molecular Foundry to sculpt complex, all-liquid 3D structures by injecting threads of water into silicone oil. While changing liquid states to solid states typically involve temperature changes, in this latest study researchers instead introduced a chemical compound known as a ligand that bonds to the surface of the nanoparticles in a precise way. "We demonstrated not only that we could take these 2D materials and undergo this transition from a solid to a liquid but also control the rate at which this happens through the use of a ligand at a defined concentration," Helms said. At higher concentrations of ligand, the assemblage of nanocrystals relaxed more quickly from a jammed state to an unjammed state. 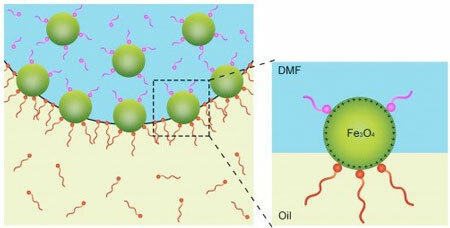 Researchers also found that they could manipulate the properties of the liquid droplets in the oil solution by applying a magnetic field – the field can deform the droplet by attracting the iron-containing nanocrystals, for example, and change the tension at the surface of the droplets. Finding new ways to control such all-liquid systems could be useful for interacting with living systems, Helms said, such as cells or bacteria. "Essentially you could have the ability to communicate with them – move them where you want them to go, or move electrons or ions to them," Russell said. "Being able to access this by simple inputs is the value of this." The study is also valuable for showing fundamental chemical and mechanical properties of the nanocrystals themselves. Helms noted that the simplicity of the latest study should help others to learn from and build upon the research. "We didn't use anything complicated here. Our goal is to show that anybody can do this. It provides clever insight about nanochemistry at interfaces. It also shows us that chemical systems can be designed with tailored structures and properties in the time domain as well as in the spatial domain." Future research could focus on how to miniaturize the liquid structures for biological applications or for energy applications in 2D materials, Russell noted. “The beauty in this work is the manipulation of nanoscale elements, just billionths of an inch in size, into larger constructs that respond and adapt to their environment or to specific triggers,” he said.